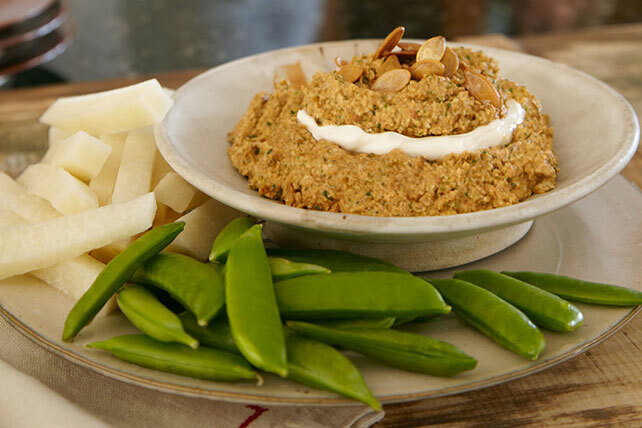 Here's a terrific way to use leftover pumpkin seeds from Halloween: Toast and grind them to make this spicy harvest-time dip. Use pulsing action to process pumpkin seeds in food processor just until seeds resemble coarse crumbs. Add next 6 ingredients; process until thickened and well blended. Spoon half the pumpkin mixture into small serving bowl; cover with layers of sour cream and remaining pumpkin seed mixture. Substitute 2 roasted serrano chiles for the habanero chile. This Mayan-inspired recipe is commonly known as "sikil pak" in Mexico. Heat oven to 400°F. Remove any loose papery skins from 1 head of garlic, keeping head intact. Cut 1/4- to 1/2-inch-thick slice off top of garlic; discard. Place garlic in center of piece of foil in small pan; drizzle with 1 tsp. olive oil. Wrap in foil. Bake 30 to 45 min. or until softened and golden brown. Time will vary depending on size of garlic head; start checking for doneness after 30 min.